I really like this advert I'm not exactly sure why but I think it's just the casual way it's represented. Plus I have a love for black and white photos. What a cool advertisement. Mr. Gates just sitting at his office desk reading the WSJ. Really neat. The future multi-billionaire is just simply sitting like an ordinary one. Look at that large floppy disk. 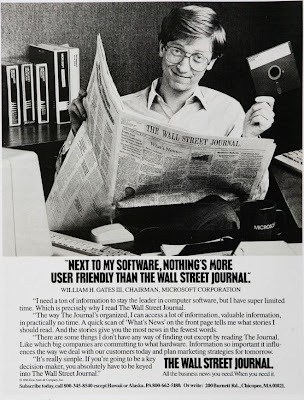 Bill Gates and his software have come a long way since then. I also Like this advertisement very much. WSJ needs an Ad like this with Zuckerberg. This is a classic. great post. Look!! Bill Gates is really a huge gate of the World in respect of Technology, I think no one stand before him as technical man.